ALLEGRA BOVERMAN/Staff photo. Gloucester Daily Times. 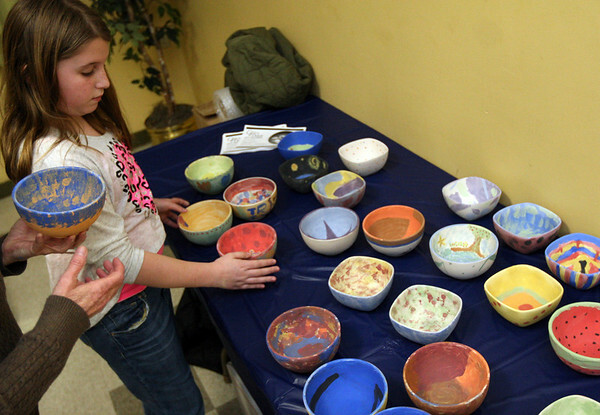 Gloucester: Samantha Pascucci, 10, and her grandmother Georgeann Morris, both of Gloucester, place their completed bowls on a table to dry during the decorating night held at The Open Door Tuesday evening in preparation for the upcoming Empty Bowl Dinner on Thurs., May 10 from 4-8 p.m. at Cruiseport Gloucester. A second session for decorating will be held on Sat. Mar. 10 from 10 a.m. - noon at 28 Emerson Ave. in Gloucester. For more information, see foodpantry.org or call 978-283-6776, extension 205.